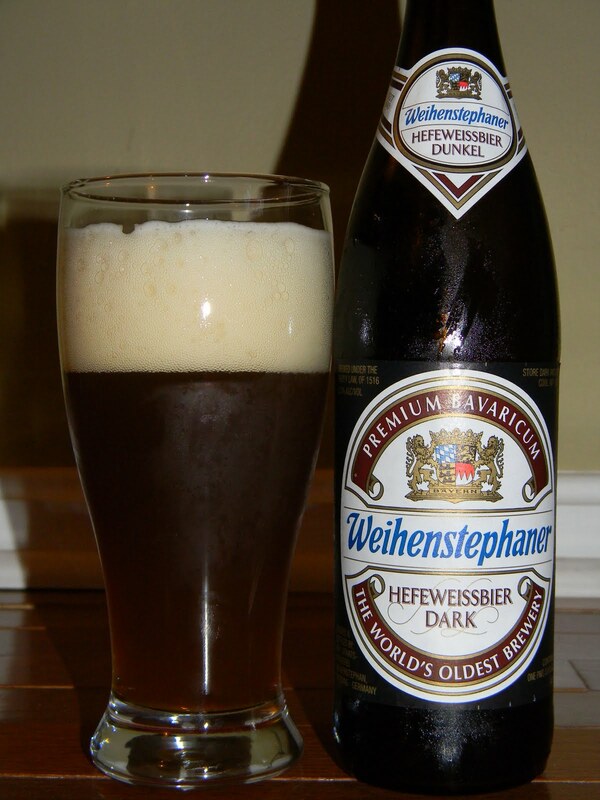 I took a trip to Kress Liquors and pulled a bottle of Weihenstephaner Weissbier Dark off of the shelves. While not a big fan of wheat beers, I was intrigued by the dark aspect of this beer. Weihenstephaner traces its roots to an abbey established in 768. The abbey received a license for a brewery in 1040. The monastery operated the brewery until 1803 when they were secularized by Napoleon. The property (brewery and all) then became the property of the State of Bavaria. Since, 1923 the brewery has been operated by the state in conjunction with the Technical Univeristy in Munich. So, with the historical provenance and the continuous production, the brewery bills itself as the world’s oldest brewery. Soft, malty and full-bodied. The well-balanced taste is our dark weiss beer’s great strength. Not only a good accompaniment to hearty meals. Appearance: Cloudy, dark brown with light foam and good lacing. Aroma: Roasted malt and citrus. Taste: Like a heavier wheat beer with more body, a little clove and a muted flavor. As I had said, I am not a big fan of wheat beers but I really liked this one. If you like a wheat style this is certainly one to try. Brew News: Philly Beer Week Saves Belgium! I too am not a fan of wheat beers, but I have found myself enjoying quite a few European wheat beers lately. I think it may be that I do not care for american style wheat beers. The Europeans seem to add some spice and heft to theirs that I rather enjoy. Highly recommend Ayinger. Totally agree with you. The Ayinger Brau Weisse is spectacular. Love it! The Europeans really know what they are doing. I’d put the Paulaner and the Erdinger right up there with the Ayinger and the Weihenstephaner. Biggest thing I’ve found with regards to taste of wheat beers, especially ones with active yeast still in the bottle, is how you pour it. That german style inverted pour works great for this style of beer. Just make sure you have a big glass though. A good beer indeed! Try that Erdinger Dunkel, too!